Itoya PolyEnvelopes are the industry standard in polypropylene filing and storage envelopes. 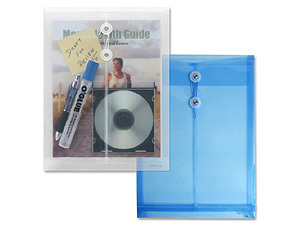 Their lightweight yet durable construction resists moisture to protect your valuables from the elements. See-through design allows for easy identification of the contents, while its top flap seals securely with the string fastener. Great for office, school, craft, hobby, art and home.